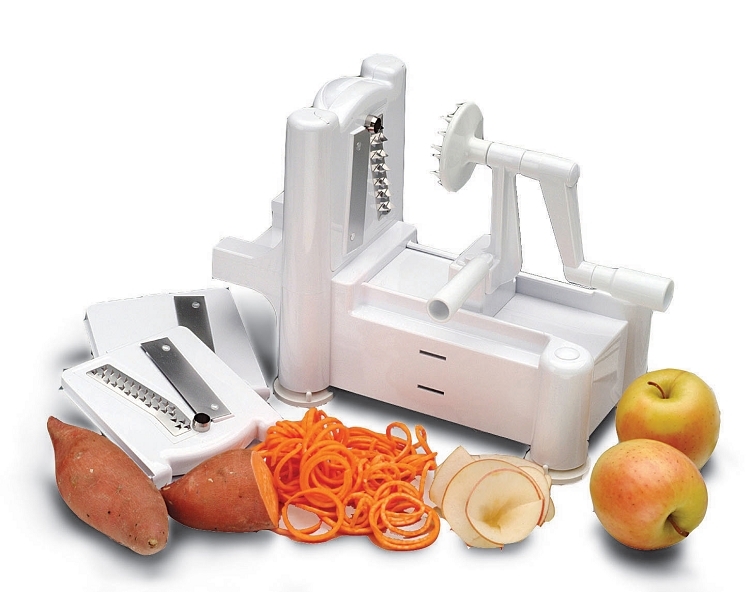 The Paderno World Cuisine Spiral Vegetable Slicer. Previously marketed as the Spirooli Spiral Vegetable Slicer, World Cuisine has re-branded it as their own spiral vegetable slicer. The Spirooli beautifully shreds, slices, and chops most vegetables and fruits. It has 3 interchangeable blades (large noodle, small noodle and slicing blade). It is easy to use, clean, and store. The Paderno World Cuisine Spiral Vegetable Slicer (formerly Spirooli Spiral Vegetable Slicer) is very similar to the Spiral Slicer but the blades produce spaghetti and linquine type strands as opposed to the angel hair pasta like thin strands of the Spiral Slicer; also, the Paderno World Cuisine Spiral Vegetable Slicer (formerly Spirooli Slicer) has three blade settings as opposed to two. For best results with the Paderno World Cuisine Spiral Vegetable Slicer (formerly Spirooli) apply constant downward pressure to the handle, while rotating. This will ensure the item being spiralized will come in contact with the blade. Produce selection is paramount for the machine to work correctly. It is important to purchase FIRM (not soft) zucchini, and not "jumbo" ones that tend to have alot of seeds. If purchasing cucumbers, FIRM English Cucumbers work best. You want to purchase produce that is shaped like a log, straight (not curved). SHIPPING •	Please allow 3-5 business days for processing and shipping - unless otherwise stated for specific products. During our Memorial Day, Labor Day and Cyber Monday sales, please allow up to 14 days for shipping, due to extremely large sales volumes. •	Shakes, bars and/or supplement deliveries to addresses in contiguous 48 United States only*. We are unable to ship supplements/shake products to APO/FPO, Puerto Rico (PR), or international addresses. •	If you are shipping to *Alaska or Hawaii additional shipping charges will apply, please select the appropriate shipping option from the drop down shipping box; this applies to all Chef Timothy All In One Protein Shakes, Diet Daily Essentials, and Specialty Packages. •	Coupon Codes cannot be applied to previously placed orders. International Orders & Shipping •	Supplements, bars and/or Shake sales available to U.S. shipping addresses ONLY •	Online programs, e-courses, e-books, and information products, that do not require shipping, may be purchased by anyone around the world. ALL International Orders (outside USA) must use PayPal for payment. Copyright Dr. Timothy Moore. All Rights Reserved. eCommerce Software by 3dcart.